You caught me. I’ve been a bad girl. I haven’t been writing much, have I? Well, there’s a very good excuse. I’ve been cast in several plays back-to-back. First, there was Shakespeare Dallas’ production of Cymbeline. I played Helen, lady in waiting to Princess Imogen (Jo Schellenberg). Me? Playing the part of a subservient lady in waiting? Now, THAT’S acting. Jo kept us well supplied with beef jerky backstage. It’s the perfect snack for actors; it’s high protein and doesn’t spill on our costumes. Shakespeare Dallas is more of a family than an acting company. We had plenty of cast party suppers. Yeah. I know. I should have gotten recipes and taken pictures. My bad. Then again, the actors' recipes were probably closely guarded secrets. Chris Hury, who played Posthumous Leonatis, made wild boar empanadas and deer sausage for the cast parties. There’s something about a man who hunts his own food that makes it a little intimidating to ask for a recipe. Intriguing, but intimidating. Then, in Art Centre Theatre’s production of Hello Dolly, I played blind-date-from-hell, Ernestina Money. Oh, the torture I inflicted on poor Horace Vandergelder (Doug Johnson). 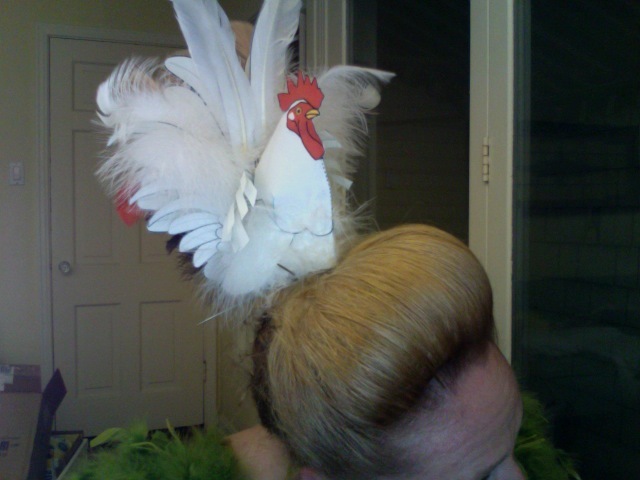 There are a lot of poultry references in the Harmonia Garden scene, so I made a rooster hat to wear. Yep. A rooster hat. Ladies of the Belle Epoche era put a lot of bird parts on their hats. Fashion. Humph. Go figure. Brewster the Hat Rooster and the intoxicating scent of the nearby fried chicken restaurant left me craving chicken every night. So, what on earth have I been cooking? Not much really. With such a busy schedule, I resorted to packaged pimento cheese spread. Don’t hate me. OK. OK. OK. I promise I’ll do better next time. Off to the Dallas Farmers Market to stock up on produce. Now, I’m in rehearsals for the musical, Quilters. It’s about living on the prairie in the 1800’s – from a female point of view. It’s made me curious to explore the food made by these strong, resourceful women. Perhaps a big pot of Cowboy Beans is in order. That’s how a food blogger should act.